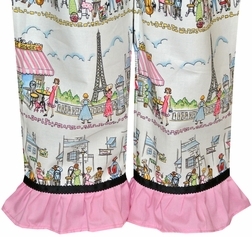 Caroline Bradlee Designs > GIRLS > Personalized Girl's Monogram Eiffle Tower Paris Outfit. 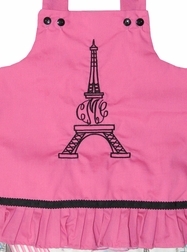 Personalized Girl's Monogram Eiffle Tower Paris Outfit. Monogram frames are all the rage, and this one is at the top of our favorites. Here we craft a pretty pink square neck swing top and make shoulder straps of pink fabric and fasten the shoulder straps with black buttons. The top is embellished with scalloped black grosgrain ribbon. The swing top is paired with either shorts or capris made of Michael Miller's fabric called Parisville. 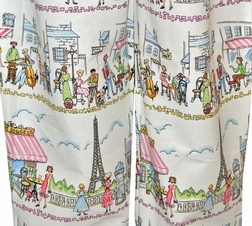 It has scenes of Parisians walking on the streets of Paris, eating in cafés and taking in the sites including the Eiffle Tower. The trousers have ruffles made of the pink fabric. The most fabulous part of this outfit? In the center of the top, we embroider a black Eiffle Tower with your little one's monogram as the center focal point. So pretty and unique. The color of the pink fabric will vary depending on availability.